Celebrating the life of Fred Wilhelm Jr.
Obituary for Fred Wilhelm Jr.
and interaction that it all gave. 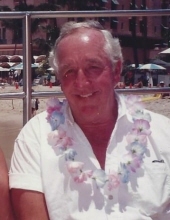 Fred enjoyed all things vintage from cars to wood furniture and had a skill in refinishing and the art of the deal. He avidly read the sports section every day and kept track of all stats and standings. He also kept meticulous lawns, beautiful flower pots, hanging baskets and vegetable gardens. Grandchildren Eric, Karla, Regina and Lance, and many great grandchildren, nieces and nephews. Fred is also preceded in death by his parents, brother Albert, and sister Betty. A Graveside Service is planned for Saturday, March 2nd, 11:00 AM at Mountain View Cemetery Auburn. Open viewing from 10-10:30 AM at Yahn and Son Funeral Home. "Email Address" would like to share the life celebration of Fred Wilhelm Jr.. Click on the "link" to go to share a favorite memory or leave a condolence message for the family.